Six Star Motorsports Portfolio is up! Our first car is THE car, Skunkworks! First off we’d like to thank Filippo Meli for giving us the opportunity to work with his vision of what he wanted as a road going machine that can hit the track and hang with the big boys. Thus the street beast was born. Outfront Motorsports put together a package for this car to breathe in all the right places. They put the cases together using OEM Polished and Balanced Crank, CP-Carrillo Custom “x” Forge Pistons rocking on a set of Manley Performance Products, Inc. I beam connecting rods w/ ARP 625+ bolts and it all rotates on King Racing Bearings. To let this engine breath right, it’s all paired up to the custom closed deck with headwork to match using a set of GSC Power-Division S2 bump sticks, Supertech +1 valves with dual valve springs, Outfront Customer Head Porting and 1/2 Head Stud Upgrade! WPC Treatmentthroughout along a set of JE Pistons Pro-seal Headgaskets is a nice final touch to things. Killer B Motorsports large capacity oil pan is used with the Canton Racing Products Accusump unit along with a custom routed Setrab Oil Cooler. The induction to this machine is as large as the engine! Custom intercooler piping fabbed up Sammy himself! Piping supplied by Ticon Industries using all vanjen connections via Vibrant Performanceclamping systems. The piping starts as a custom 4 inch intake with a breather unit to help retain proper evacuation from the Radium Engineering and Killer B Motorsport compounded AOS system that we built. This plumbing then heads to the Extreme Turbo Systems 4 inch core and back up to the immensely sized Boomba Racing DBW Throttle Body. To help relieve all the boost pressure it’s assisted with the TiAL Sport Q BOV in black. Of course, only the most power producing manifold can be used so of course the Process West unit is the only option we can use for efficiency. All of this boost pressure is made possible with the Full-Race Motorsports Twin-Scroll Turbo Kit. The beast of a turbo to make this power is of course the BW EFR9180 w/ the T4 1.05 hotside. Turbosmart twin EWG’s are used to control the boost pressure while tuning in the GrimmSpeed EBCS. The exhaust system is plumbed into a TOMEI Titanium Cat-back unit. To get all this power made you need to not only move a lot of air but you need to move a lot of fuel with it! So to make sure we have enough flow there is a Holley Performance Products Dominator Dual Brushless Fuel pump w/ Controllers. Supplemented with the proper filters and FPR we enlisted the help of Radium engineering again to move the fuel to where we needed it. The In-tank dual 480’s feed a custom 3 gal surge tank which is gravity feeding the massive Holley pump with -16 fuel lines! The fuel gets fed up to the engine via Radium Fuel Rails and Injector Dynamics 2000cc Fuel Injectors. All of this gets dialed in using the Six Star Motorsports Flex Fuel Kit. To help keep things cool during all of this power production we’ve customized a Koyo Radiator up front, thermal ceramic coatings provided by Lo-Ko Coatings which came out beautifully. We also integrated a Setrab cooler for the differential along with the Tilton Engineering hydraulic pump to ensure we’re always moving that fluid in and out of that oversized MooreSport rear diff cover which houses the ATS Carbon 1.5 way LSD. Rolling around like that needs to stop so after we installed the massive StopTech trophy kit brake system we added in the APR Performancebrake duct cooling kit and planted it all down with the Volk racing wheels TE37SL’s and huge 275/35/18 BF Goodridge Rival Tires. For the street it’s enough tire to keep it from walking around at 30+ lbs of boost. The trick with the project was the monitoring system but when done man is it WONDERFUL! An AEM Performance Electronics CD-7 Digital Dash Display is used with custom inputs for every sensor and monitor you can imagine. More than any gauge system can ever offer it’s fully customizable and allows you to communicate with the can-bus system like stock. Because of that we opted to retain the OEM ECM and use the COBB Tuning Accessport. Graham Gaylordm of Boosted Performance Tuning did his magic with the Ignite Racing Fuel and turned those rollers past 800hp with ease. We think it’s a good start to get some seat time with the car for sure. To make sure this isn’t just some lame looking car some exclusivity and attention was put into the accent pieces, body work and aero! Varis Japan MFG Co.ltd underboards and rear side-splatter fins applied along with the full carbon diffuser and custom painted hood! Voltex adds some downforce with it’s massive Type “7” GT Wing! 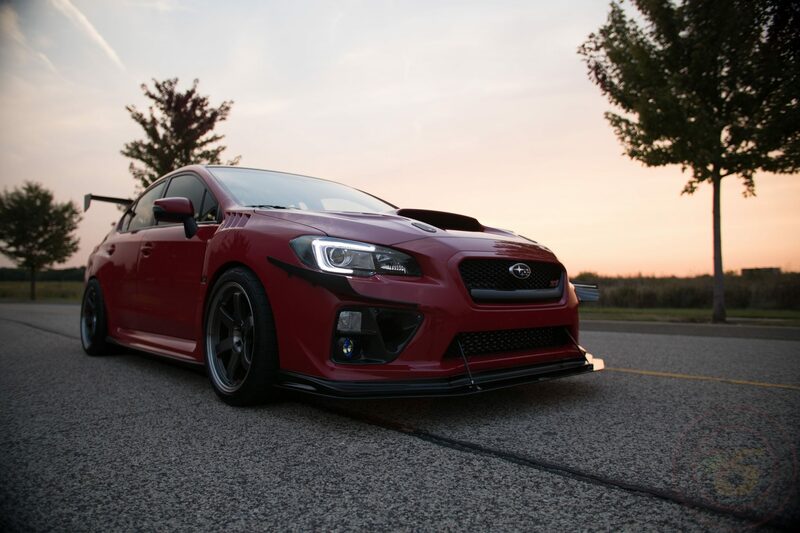 The OEM Bumper uses the APR Lip kit and Front Splitter with custom SSM Mounting utilizing the Quik Latch Distribution push-button releases for simpler on & off application. It makes removal of the splitter a breeze! Eric Dewey DeWitt from THMotorsports.com for being a HUGE part of the Skunkworks project. DSPORT Magazine and the editors there! Almost forgot about the photographers of the project. Daean Chase and Michal Kubik for putting together such a great showing of the car!